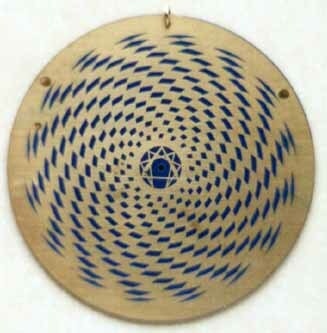 The sensor disk, created by Patrick Flanagan, reflects the spiraling movement of consciousness in and out of our grid reality, the front and back showing reverse spirals. Spirals take us to sacred geometry, the golden proportion upon which all things in are reality are created and experienced in the hologram of physical reality. As the story goes ... 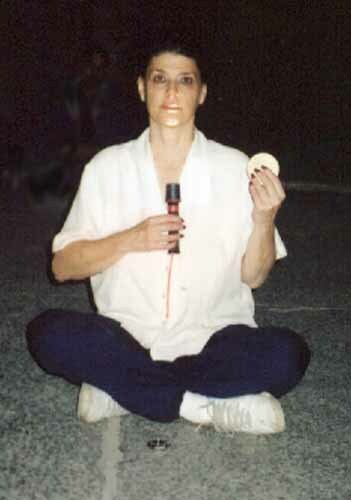 In 1975 Flanagan spend a night in the King's Chamber of the Great Pyramid, where Thoth allegedly appeared and gave him instructions on how to create the disk and its uses. The Sensor was developed by scientifically measuring the cosmic energy which is continually broadcast from the capstone of a properly designed and magnetically aligned pyramid, based on the sacred geometry and physical measurements of the Great Pyramid at Giza, Egypt. The Sensor is very powerful little device and can effect any living organic material in positive and beneficial ways. The Sensor is actually a dialectic substrate (printed circuit board) featuring concentric copper rings coated with 24K gold. The rings on its surface represent a flattened, omnidirectional pyramid design on a 2 dimensional surface (a very advanced concept for 1975). The Sensor's broadcast the same amount of energy as a 12 foot base (or larger) pyramid structure. They can be used to energize food, neutralize harmful energies, for meditation, for healing, etc. A 12" diameter meditation Sensor was designed to be placed under your chair for healing. 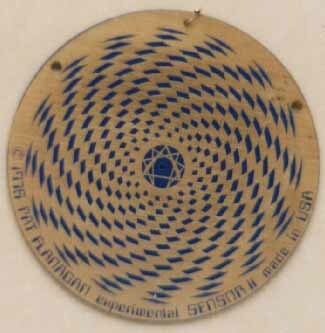 This was one of the first working "Free Energy Devices". The device harnesses the Earth's magnetic field, coupled with the Earth's natural bio-gravitational and electromagnetic forces then combines those with the cosmic and etheric energies naturally present throughout the universe. These devices are omnidirectional meaning they do not need to be magnetically aligned like a traditional pyramid. My friend Steve, a remote viewer, called and asked about the disk, describing it perfectly, which blew me away! He said it is a key for me to use in Egypt. "The disk is to be placed vertically into something in a stone wall, after which a door slides opens. It connects with the number 12. Next you hold that rod I told you about. The rod is holding balance scales that are high on the left and down on the right. You have to balance the scales as you have done before. You can do it. It's easy." Trae, another remote viewer, as well as the Admin for Crystalinks, called. He connected with the disk immediately and also saw it as a key. He saw me using it to open a door, if not physically then metaphorically, and passing through. Inside was a circular room that looked like 360 degrees of motion picture screens in constant motion. They were similar to the screens I had seen in my 1954 experience in the Nevada desert. As we studied the screens we saw all of the programs in all realities moving at the simultaneously. It was as if we had stepped into the control room of a giant computer. Trae saw Z merge with me as I felt Z's energies. Trae saw me use my hands to stop the images on the screen, as if stopping space/time or the program hologram. I appeared to make an adjustment, after which they restarted. This reminded me of what Steve had seen - a cave with a giant screen that has images that kept moving in a circle, representing the projected illusions (programmed consciousness) of our reality - all viewed through the Eye or All Seeing Eye of Time, God, Illusion. The screen images were black and white ... and I was told that when I see them in color, the program will be at closure. This would not happen until August 2007. Woodborough Hill (3), nr Alton Priors, Wiltshire - Reported August 13, 2000. 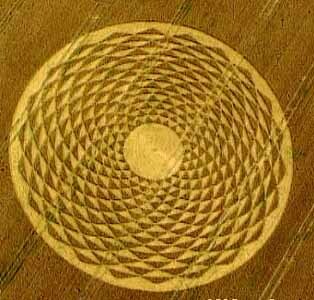 The efficient use of nature's own spiral, the Golden Ratio, is illustrated 44 times in this sunflower crop glyph. 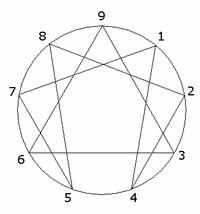 Together with its 14 rings, the formation gives the numbers 44/14, or 22/7 - the convenient number for Pi.